If you feel like something is wrong and repairs are needed, you may be right. Some minor repairs can be done at home easily, but more serious problems will require skilled professionals. Let’s take a closer look at some of the more common problems that people have that require acoustic ceilings service. 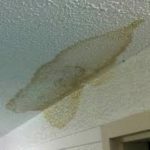 The most common culprit that causes people to need acoustic ceiling texture repair is water damage. Unfortunately, this is a cause for concern for most. Since water damage is causing problems for your acoustic ceiling texture, it means you have a leak on your roof somewhere. Rain water is getting in through the roof and damaging the ceilings. This is usually a localized problem, affecting only one or two rooms. If this is your problem, call a service professional immediately! You can almost always tell if this is the problem by feeling your ceilings. If they feel damp or even wet, it’s definitely water damage. Aside from a leaky roof, other things can cause water damage to your acoustic ceiling. An accumulation of condensation in the air over time can cause water damage. Sometimes, air conditioning units can cause condensation in the air if they are leaky themselves. 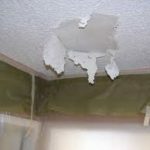 Other times, leaky water pipes can cause water damage to the ceiling. Call a pro for water damage repair. If there is structural damage between the ceiling of your room and the roof of the house, it could be causing damage to your acoustic ceiling texture. Unless your home has an attic or a crawlspace, there is no easy way to tell. Your best bet is to call upon a service professional to come and have a look. This is a sure way to find out if you need structural damage repair. 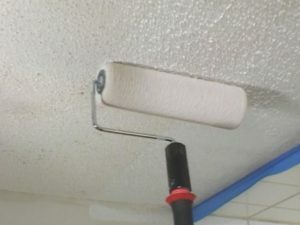 For the simplest fixes, you can use a spray can of acoustic ceiling coating. These are generally inexpensive and can be found at your local hardware or home improvement store. Simply spray it onto your ceiling. It’s a good idea to practice it out first on something like a pizza box or cardboard box. Once you have a good idea of what to do on your ceiling, go for it! If you are unsure, contact a quality drywall repair company for help. If you don’t feel comfortable doing it yourself, call your local dryer repair service. They have specialized tools that will make the job easier and safer for everyone. Moreover, they can work with old ceilings that may or may not contain asbestos, which is harmful. If you are unsure about your roof, ask your landlord, or find out some details about the home you own. When was it built? That’s a great starting point, as popcorn ceilings built in the late 70’s and early 80’s may contain asbestos.